While the influx of new migrants from the home country tends to intensify Egyptian cultural influence in the life of Coptic Orthodox parishes in the U.S., the church is attempting to create spaces where converts and second- and third-generation people who are fully integrated into the American way of life can feel comfortable, reports Shira Telushkin in The Atlantic (March 31). Although the Coptic Church is marked by and proud of its ancient Egyptian heritage, and while its diaspora presence has grown dramatically since its modest beginnings in the 1950s and acceleration from the 1970s, it would be wrong to see it only as a church for migrants. For decades, it has conducted active missionary work in sub-Saharan Africa, answering calls from inquirers in several countries, with its first bishop for those areas consecrated as early as 1950. In America too, the Coptic Church has been attractive for some converts, either religious seekers feeling they would thus reconnect with a most ancient Christian heritage or people wanting to marry a Coptic believer. But many subsequently left for cultural reasons, feeling like foreigners in the church they had joined. Americanization had been progressing, but the arrival of many new immigrants fleeing an uncertain future for Christians in Muslim countries meant that parishes often answered their needs by going back to a more Egyptian style, both linguistically and culturally. This situation has led the Coptic Church in America to start opening parishes where the liturgy remains the Coptic one, but is celebrated in English, and where preaching is done in an American style. “In the past decade, dozens of Americanized Coptic churches have opened across the United States, concentrated in Texas, California, and along the East Coast,” Telushkin writes. 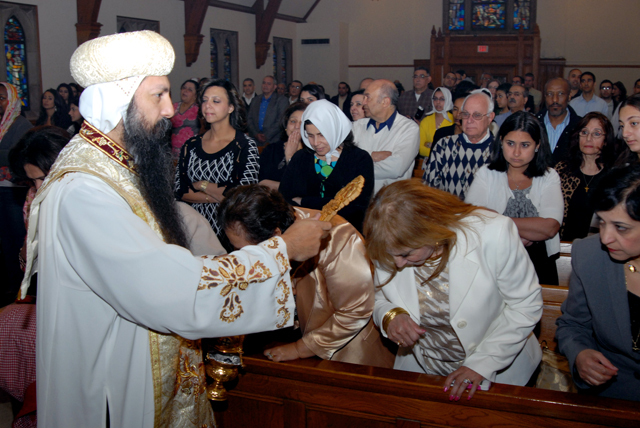 In 2015, one Coptic bishop launched a structure specifically meant for U.S.-born believers (both people of Coptic background and converts), which now counts several parishes. Not unexpectedly, not all Copts have welcomed such trends. In contrast with those enthusiastic about missionary efforts, some feel culture and faith to be strongly connected and fear that losing one might lead to losing both. They are afraid that a new structure such as the one established in 2015 might end up in breaking with the church. Similar to the way of thinking of religiously diverse migrant groups, others answer that the purpose behind the emigration of Copts from their home country might actually be to spread their faith across the world.